Business as usual in the AFC North. This year will not be the year that streak is broken. And while Cincinnati took the crown in 2015, we give them just a 36 percent chance of repeating. It’s hard not to think of the Steelers as a defensive team. The franchise that gave us the Steel Curtain also had the best sustained defense of the 21st century. From 2000 to 2012 they allowed the fewest yards in the NFL six times and finished in the top 10 every season. No longer. The Steelers have quickly transformed into an offense-first squad, 21st in yards against and 3rd in yards gained last season. They have the best wide receiver in the NFL and the best running back unit (after Le’Veon Bell wraps up his three-game suspension). They went 8-4 in 2015 when QB Ben Roethlisberger wasn’t out with an injury, and Vegas has them at 10-1 to win Super Bowl LI. That’s tied with Panthers and behind only the Patriots, Seahawks and Packers. 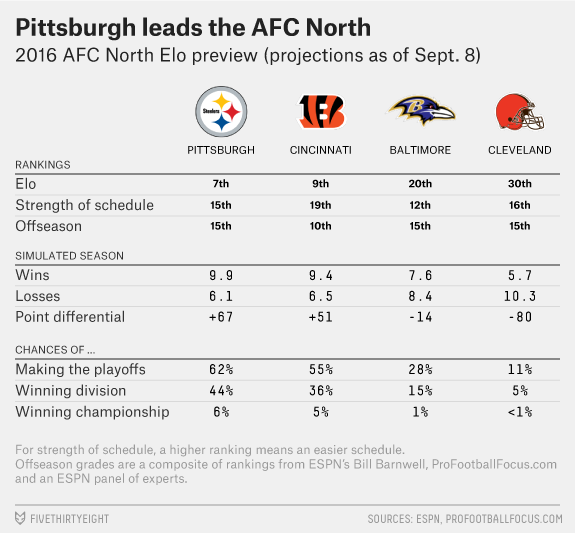 Our preseason Elo projections are a little less bullish, putting Pittsburgh as the seventh-most-likely Super Bowl winner. The Steelers could improve from last season just by having Roethlisberger for all 16 games, but they’re without their starting running back for three games, plus receiver Martavis Bryant has been suspended for the year and veteran tight end Heath Miller retired. Bryant and Miller combined for 1,300 receiving yards in 2015. There are a lot of ways an NFL franchise can be depressing. The Bills lost four straight Super Bowls. 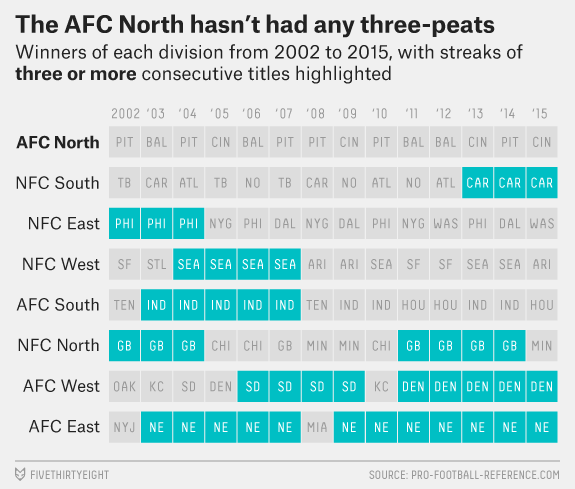 The Browns and Lions have never made it to one. And the Cincinnati Bengals are winless in their last seven playoff games, wasting some of the best seasons in the franchise’s history. Last year was especially brutal. The Bengals looked outstanding at the start, going 8-0 with wins over the Chiefs, Seahawks and Steelers. After their Week 9 victory over the Browns, the Bengals hit a new franchise Elo high of 1672. (This was only good for third-best Elo in the NFL at that moment, which itself is pretty depressing, if you think about it). They finished at 12-4 with a +140 point differential — the best regular season in franchise history — but they lost starting QB Andy Dalton to injury in Week 14. Everyone knew what was coming next. Like clockwork, the Bengals lost their Wild Card game for a fifth straight year. To refresh your memory on the specifics, Cincinnati trailed 15-0 entering the fourth quarter, pulled ahead 16-15, and and then committed not one but two egregious personal fouls to hand Pittsburgh a game-winning field goal. Cincinnati will carry over a lot of its talent from 2015, but very little pride. What happened to the Ravens? The 2014 squad was the 7th-best in the NFL per our final pre-Super Bowl Elo ratings, after a 10-6 season that ended at the hands of eventual champion New England. Going into 2015, we projected Baltimore to win 9.3 games, with a 55 percent chance of making the playoffs. They went 5-11. The Ravens’ 2015 misfortune was twofold. They did terribly in close games, with their first eight losses coming by margins of six, four, four, three, five, eight, two and two. They also had a ridiculous number of injuries. Neither of these issues were totally random; strategy can cost teams in close games, and players are more likely to get injured when they’re members of one of the NFL’s oldest rosters. But luck played a major part too, and the Ravens are a trendy bounceback candidate for 2016, with Vegas putting their over/under at 8.5 wins. We expect them to improve as well, but only to 7.6. 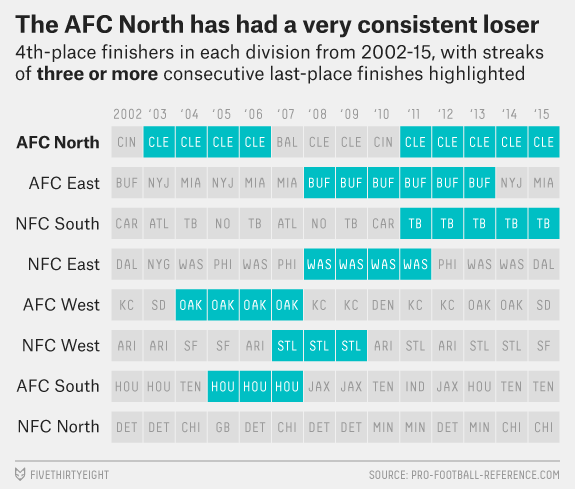 The Cleveland Browns have finished last in the AFC North for five straight years and in 11 of the last 14 seasons. It’s the kind of franchise that’s in a position to make some gambles, so this season they signed quarterback Robert Griffin III and made him their starting QB. The saga of RGIII has been such a bummer these last couple of seasons that it’s easy to forget just how great he was in 2012. As a rookie, Griffin led the league in yards per attempt (8.1), edging out Peyton Manning. He also tied Tom Brady for the league’s lowest interception rate (1.3 percent) and added 815 yards and seven touchdowns on the ground. He closed out the season with seven straight wins to lead Washington to the playoffs, and if it were not for Adrian Peterson’s incredible 2,097-yard season, Griffin might have had a legitimate case for MVP. Griffin took huge steps backward in 2013 and 2014 and then got benched for a year. But if the 2016 version of RGIII can be three-quarters the player he was in 2012, he could be the best quarterback the Browns have had in years. It’s something to hope for, at least.